Georges, named after the painter Georges Seurat, just moved in to a new apartment building after his parents had to sell their house, due to his father losing his job. This makes life even more difficult for Georges, because a) he doesn't really have any friends, and in fact is bullied nearly every day, and b) he hardly ever sees his mother, who works at the hospital and has been there full days ever since the move. On one of the first days in their new building, Georges and his dad find a sign for the Spy Club. On a whim, his dad writes the note, "What time?" and thus begins Georges's strange and unpredictable friendship with Safer, a boy his age who calls himself a spy. As Georges and Safer get deeper and deeper into investigating a neighbor whom Safer just calls "Mr. X," slowly we see that everything might not be as it seems. I was really looking forward to reading Stead's newest novel, after her beautiful and captivating Newbery Award–winner When You Reach Me. 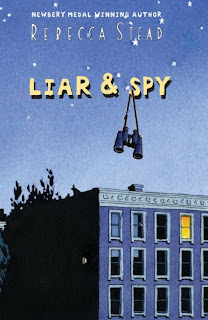 I'm sorry to say I didn't love Liar and Spy as much as I was hoping to, but I am glad I read it and it is a lovely little story about friendship and confronting your fears. Though I felt the story itself moved slowly, this is the type of book that you need to be patient with if you are going to get anything out of it. It is slim, so you're not necessarily slogging along waiting for the action to happen, but I personally did feel a bit antsy during the middle. However, in the end it was completely worth it and I felt full and happy after turning the final page. Perhaps my favorite aspect of the book is standing up for yourself and facing your fears, be they worry for loved ones, bullies at school, or any number of smaller everyday fears. Georges handles being teased pretty well from what I gathered, though he is mostly passive and realizes he needs to do something if it's going to stop. Along the way, he forges new alliances that might just turn into friendships. Safer also has fears to conquer, though I'll let you discover those on your own. All in all, I enjoyed Liar and Spy, especially toward the end, though it didn't live up to my expectations after having read When You Reach Me. But maybe that's unfair. It's still worth the read. Disclosure: The publisher sent me an advanced reader's copy of this book. Ahh. I love that feeling. Books that make you full and satisfied are the best. I've noticed something. All the Newberry books give you that feeling, don't they? Most of the Newbery books do. Personally I was surprised the The Higher Power of Lucky won that award because I thought it was only just okay, but usually it's a pretty good measure. I really feel like I need to read When You Reach Me now. 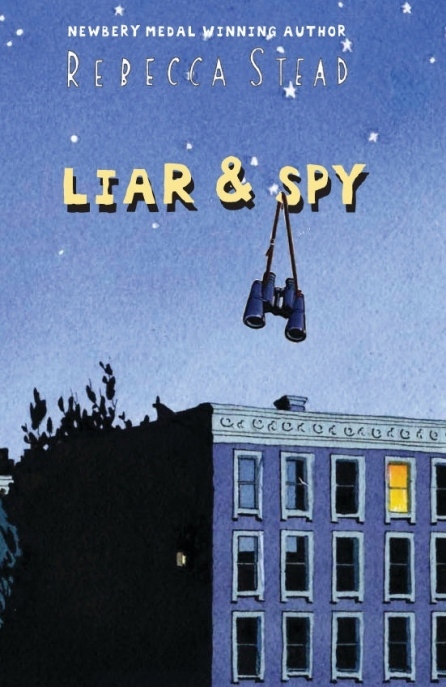 I enjoyed Liar & Spy but I didn't love it. I bet WYRM would impact me more. I thought it was much better. Especially if you loved A Wrinkle in Time.